The December Spartan Sprint was so much better than November! I got three contacts on 20M, three on 80M and six more on 40M. Band conditions were a lot better this month and the noise level on 40M was very low. I had some serious problems with the contacts on my homebrew paddle. I had to stop and clean them twice. Thanks to those of you that were patient with my operations! The batteries are a bit “puffy” but will likely be OK for a few more months. As usual after a big DX contest, I think most of us were radioed-out so turnout may have been a little light tonight. However, many thanks to those with whom I had the pleasure of contacting and my sincere appreciation especially to K4ARQ and N3VKM for sticking with me to make valid contacts. Elecraft KX3 @5 wts to G5RV antenna; Vibroplex Square Racer Deluxe.Enjoyable event. Ten (10) QSOs - including N5GW (Gene) twice (80 & 40). Happy Holidays to all! Pretty slow evening in Colorado. Thanks for the Q's. Used a KD1JV Tri-Bander, Z-match tuner, & doublet. KX3 with internal bats and ATU to CFZ. I was pleased to find activity on 20M this late in the year, and was able to work ten sprinters there. 40M was in fair shape, but not much activity heard on 80M. From Pennsylvania, used my MTR 2 on 20 mtrs. single band. Tuned dipole at 28 feet. Whiterook paddle and 370 mah lipo. Band sounded ok. Got 8 contacts. 3 California, 3 Texas, and 1 Idaho and 1 Colorado. K6CSL was my last contact at 0248Z. Missed Don, K3RLL, in Florida. Not sure if he was on or not. Will try again in January. Had Fun. Thanks for the contacts all. Running an ATS-4 at 5 watts to an OCF dipole. Slim pickings. Best DX was Randy K7TQ. 4 Qs on 20 meters and 3 on 40. Thanks for the fun. K1 at 5 W to a 2-element mini-beam at 25 ft for 10, 15, and 20 meters, an inverted vee at 40 ft for 40 m, and near bottom-loaded, ground mounted vertical for 80 m. 6 QSOs on 20, 8 on 40, and 3 on 80. Almost had W5ACM on 20 but I couldn't hear his exchange - hopefully, next month. W3KC was strong on 40. Two-banders with AB9CA, WB5BKL, and NØTA on 20 and 40 and with W3KC on 40 and 80. Overall, signals weren't all that strong here in Albany but they were pretty consistent with little QSB. Happy holidays! Hope to see you all in 2015. K3/10 @ 5W to various delta loops and wire antennas. Missed last month due to family obligations. 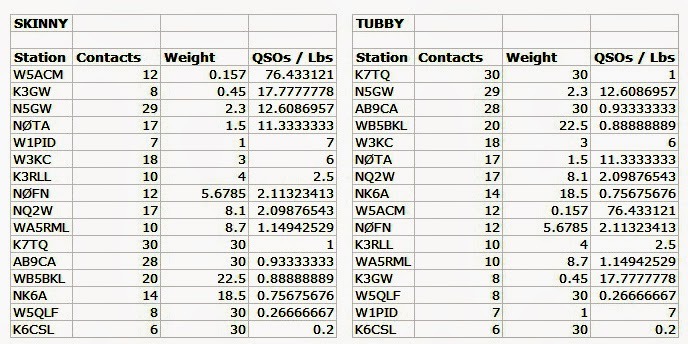 Most of the QSOs were on 20 this month. Tried 15M with no success. No three-banders this time but several doubles. Worked 13 states. Nice to hear some new calls. My thanks to all. Had fun. What fun and challenge tonight on 40 meters. At first I couldn't find anyone calling CQ SP, just pile-ups and QSOs from 7.025 to 7.050. My first sprint contact was AB9CA and I worked 10 more sprinters after that between 7.041 and 7.044, even calling CQ for a while. I burnt up my supply of NiMH AAs with a short circuit in an Arduino project, so my 1.25 lb rig played with a 4.5 lb battery tonight. Thanks to all for the slow fills and repeats, especially WA5RML. A good evening here in ID. Went the entire time for a change. First hour was 20 Qs with second one 10 Qs. Both bands by NK6A, W5ACM, WB5BKL, NØTA, N5GW, and K6CSL. Tough time on 20 with W1PID, but we made it. Catch you all next year. K2 at 5w, 100' wire up 60 ft. Have re-arranged one end of this wire and raised it 30 ft or so. Not sure what effect that has, if any. Have been busy and missed last couple of sprints. Good to be back tonight. Condx seems OK. Not really good, but not bad either. Band breakdown for 20/40/80 was 5/18/5. Know I missed one on 20. Just could not pull you out. 40 was pretty productive. From NY to CA and FL to MN. The noise on 80 was not too bad. Worked NC, TX, MS, and MD there. Heard only those few. Dunno if others did not go there or if prop was not good. Those pesky Texans were out in force tonight, total of 7 out of the 28 Q's were TX. No 3-banders but had 2-banders with NØTA, NQ2W, W1PID, NK6A, W5ACM, N5GW, WJ4A, WB5BKL and W3KC. Thanks to everyone who dropped by. Hope to hear all of you (plus more) next month. Always fun. This time most contacts were on 40 and a few on 80.